WATNEY MANN Known as the COUNTRY STORE in mid 1980's? In 1830, Vans by Thomas Crowe travelled to Kenninghall every Wednesday at 8:00pm. 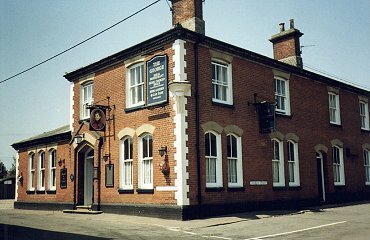 Carrier Cook travelled to Kenninghall every Saturday. to the parish by an unknown donor. incumbent curate, and the other for the schoolmaster, for teaching 6 poor boys. By 1854 the yearly rent was was £30. 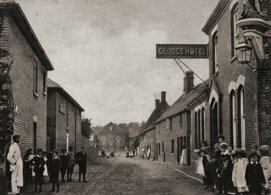 Although the licence was transferred from John Townshend to William Easthaugh on 20th December 1870, Mr. Easthaugh was certainly at the GEORGE HOTEL prior to that date, since on the 30th November 1870 William Johnson of New Buckenham broke a window and refused to leave the premises. Upon the evidence of innkeeper Easthaugh and the report of P.C. Kirkpatrick, who said Townshend was drunk and riotous, the accused was fined £1 1s 6d, which included costs.